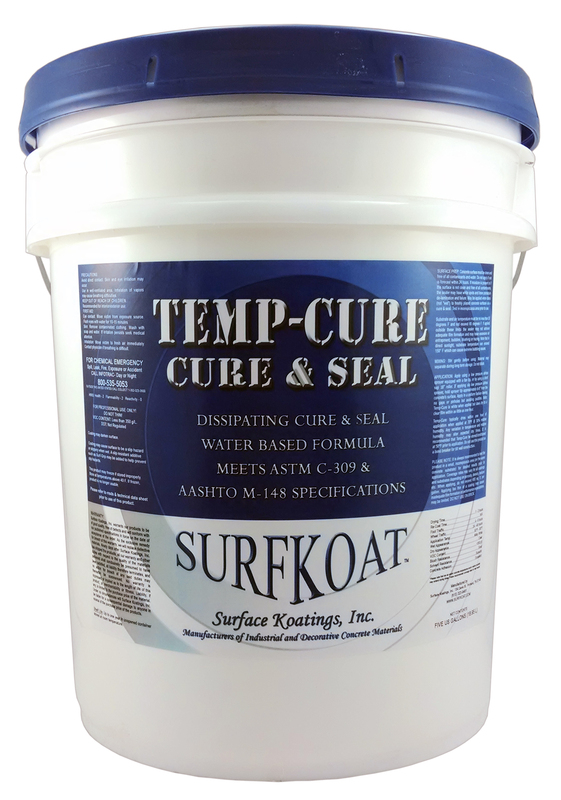 Temp-Cure is a clear, water based resin curing compound for concrete. Temp-Cure efficiently cures concrete and then decomposes rapidly when exposed to ultraviolet light, sunlight, and abrasion. It is a VOC compliant alternative to solvent based dissipating resin cures. Curing interior or exterior, horizontal or vertical concrete surfaces. Floors scheduled to receive subsequent treatments of dust-proofers, liquid hardeners and densifiers or penetrating water repellents. Slabs designated for polymer coatings, such as epoxies or urethanes, paints, sealers, thin set mortars or floor covering adhesives. Walls where a waterproof or decorative coating will be applied.